Interested in a law enforcement position? If so, it's important to note that a majority of law enforcement agencies require you to take an exam to qualify for a position. JobTestPrep can prepare you for the exam with our custom made practice packages, start preparing now and apply with confidence. 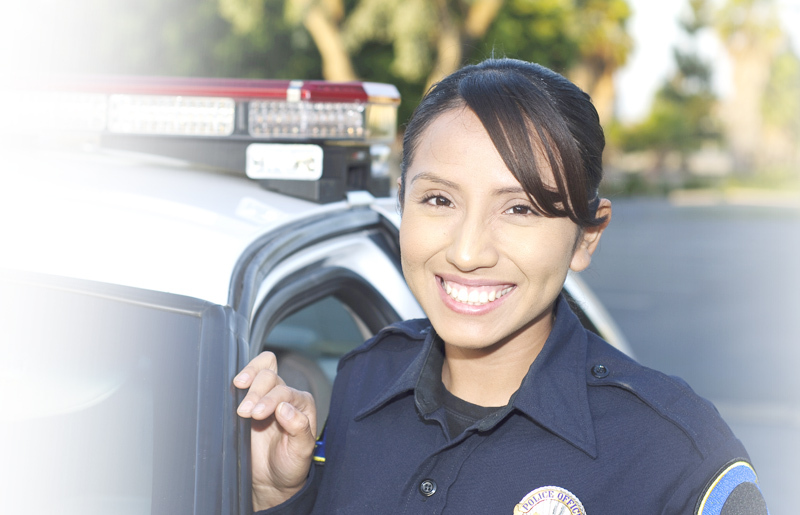 Law Enforcement covers a wide range of jobs throughout the United States. The most typical agency filling the positions in law enforcement are the police. When applying for any law enforcement job, you will most likely encounter an exam, which will measure skills and abilities that are needed to be a successfully law enforcer. There are many different law enforcement entrance exams. Entering the field of law enforcement requires the successful completion of several hurdles: Written test battery, physical fitness test and interview. You can expect a multiple-choice format with at least 100 questions in each section. This is a timed test that is administered in either a computer-based or Paper & Pencil format. Prior knowledge of the law enforcement field is generally unnecessary. All scenarios contained in the entry-level law enforcement aptitude test are based upon actual work situations. Scoring - If your test score falls below the passing threshold, your employment application comes to a halt. Passing scores are usually within the realm of 70% to 80%. The higher your score, the greater your chances of securing a job. Exam Sections - On the personality questionnaire, you will find a short timeframe; statements assessing preferences, attitudes and interests; and a five-point agreement scale, from “strongly agree” to “strongly disagree.” The goal of the personality section is to highlight those who are best suited for law enforcement work. The cognitive ability section, by contrast, commands approximately a two-hour time limit. It is composed of general-knowledge items that require logic, reasoning and at least a high school education. This portion of the police entrance exam spans a wide range of basic topics. We provide a variety of practice tests for law enforcement positions to help you prepare for the exam. If you are interested in a Federal position, take a look at the Federal Law Enforcement Exams that we offer. Verbal Comprehension – Assessing the ability to understand language, the focus of this skill is on words, phrases and sentences. Job-related scenarios are presented, each followed by questions involving the information contained within the passage. Police officers use this ability to decipher law enforcement elements such as incident reports; descriptions of people, places and situations; and work orders. Verbal Expression – This skill is comprised of the use of language to communicate information. Some of the facets of verbal expression include grammar, vocabulary and the ordering of words. Two of the question types presented involve: 1) Selecting a word or phrase that completes a sentence; and 2) Identifying misspelled words in a statement. This section can also be called the law enforcement vocabulary test. Spatial Orientation – As a police officer it is essential to maintain an accurate perception of your whereabouts in relation to your surroundings. Maps and layouts are utilized to assess your directional abilities. Identifying the best route from your position to a specific destination is a common spatial orientation task. Problem Sensitivity – The focus is on the recognition of problems presented in a scenario, as well as the ability to solve those difficulties. These types of questions are generally referred to as situational judgment questions. Mathematical Reasoning – Ratios, proportions, averages, percentages, charts and tables are some of the elements that you are likely to find on the mathematical portion of a police test. Number facility – You will encounter word problems and basic arithmetic questions, along with the tasks of computing area, perimeter and circumference. Deductive Reasoning – The exam presents items requiring the application of a general rule in order to determine logical conclusions. Various other test items will necessitate the use of a rule to classify specific elements. Inductive reasoning – The task is to discover the rule that fits the specifics. Expect to encounter charts and tables in the assessment of this particular ability. Visualization – This skill involves the identification of various geometric shapes when placed in different positions, and the identification of the parts that fit into a whole item. Police officers utilize this ability when identifying faces or objects that have been altered. Information Ordering – Short passages are presented. The task is to sequence information per logic or rules. Flexibility of Closure – Finding obscure objects on a page, is the equivalent of picking out a specific face in a crowd. Selective Attention – When answering questions referencing this skill, you will be exhibiting your ability to concentrate on a task amid chaos. This aptitude is essential when performing a security check within an environment that is saturated with commotion. Test items will require the identification of the pattern that is identical to the main pattern. JobTestPrep offers comprehensive law enforcement aptitude test preparation Confidence, a positive attitude, strategies and familiarity with law enforcement test questions and format will all enhance your exam result. JobTestPrep has worked to provide a thorough Law Enforcement Test Preparation Package, focused on optimizing your exam experience. With JobTestPrep’s law enforcement exam study guides and practice law enforcement exams you will rise to the top of the candidates list.